With forests, national parks, beaches, mountains and everything in between, California has some of the nation's best and most diverse trails for hiking. You could spend a lifetime checking out the routes in this west coast state and still not cover them all. Ranging from multi-day treks through thick woodlands to breezy, short hikes just along the ocean, the parks here offer something for everyone. 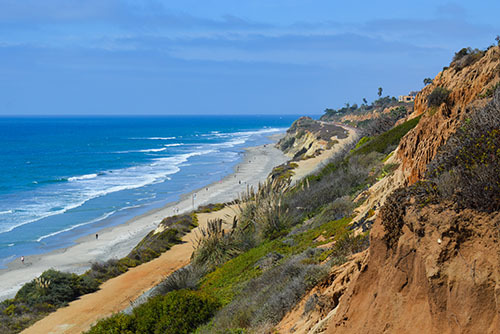 Located just north of La Jolla in San Diego, the Torrey Pines State Natural Reserve is a haven for local and traveling outdoor enthusiasts alike. With miles of shoreline and unmatched views of the sprawling Pacific Ocean, this state reserve offers 1,500 acres of land, sea and sky gems, according to the reserve's official website, managed by the Torrey Pines Docent Society. As the site explained, Torrey Pines is not a park - it has reserve status, meaning that it is a protected area of conservation with unique restrictions. This is to safeguard the many unique and limited plants and animals, as well as geological formations, inhabiting the land. As such, guests are asked to respect the protection rules of the reserve. You can spend a morning looping through the half-mile Parry Grove Trail, pack a picnic to enjoy at the top of the High Point Trail with exceptional views of the lagoon and the reserve, or spend an entire day tackling all 10 trails of both the main reserve and reserve extension. With snapshots of La Jolla, sprawling ocean views and hundreds of exciting new flower species, it's easy to get lost in the natural wonder of Torrey Pines. A beautifully hot stretch of protected land formed by the Mojave and the Colorado deserts, according to the National Park Service, Joshua Tree National Park in southern California is at the top of any road trip itinerary. For avid hikers, this park offers a number of moderate to difficult trail options with some overnight hikes that can last two to three days and cover as many as 35 miles. One of the best hikes in California, however, is the Lost Palms Oasis route, according to the Huffington Post. This remote, 7.5-mile trek is not for the faint of heart and even requires a taxing climb out of a canyon on the return. The views at the end are well worth the effort. Once you reach what seems to be a mirage of the Salton Sea and a group of palm trees in the middle of the desert, you'll know you've reached the oasis, according to the Huffington Post. This hike begins at the Cottonwood Spring parking area and is estimated to take between five and six hours. During the height of summer, this route can be quite demanding and bringing extra water is highly advised. Famous for its redwood forests, Northern California is rich with lush vegetation, acres of sprawling green and woodlands. According to Explore the USA, Fern Canyon in Prairie Creek Redwoods State Park is a great place to explore the natural beauty of this part of the state. The trail is different than almost any other hike you may have done and you'll be trekking through the canyon itself for most of it. The walls of the canyon are something themselves as they are covered layers of rich, natural greenery. Keep in mind that with lots of creek crossing, it's unlikely you'll be able to keep your feet dry. This hike can last for several hours, depending on your speed. As the Huffington Post noted, this particular trail does tend to fill up fast. Getting an early start to beat the crowds is generally advised. One of the iconic granite domes in Yosemite, Lembert Dome is among the least challenging but still delivers on mileage and summit views, according to blog California Through My Lens. The first part of the hike is generally easy with only a steep incline through the forest. Don't be fooled by the first "false summit" you'll come to after clearing the tree lines, advised the source. The true summit is actually much steeper and quite slippery as well, so sturdy hiking shoes will be your best bet. From the top you'll gain a breathtaking panorama of your surroundings, including Cathedral Peak and Mount Dana, as well as the endless Tuolumne Meadows below. Snowcapped mountain peaks and tall green pines make for a truly beautiful backdrop to it all. If you want to switch things up on your way down, there is the option to take a different trail back - the Dog Lake trailhead. Wherever you hike, be sure to pack plenty of food and water and inform someone of your trekking plans.